It’s become somewhat of a commonplace to say that food has a magnificent power of bringing people together. As cliche as it may be, this keeps proving true time and time again in my case. Initially not the most communicative person, I have gradually opened up to the idea of meeting new people over a meal, largely thanks to attending supper clubs. The moment of starting KinoVino was definitely a sign that I was willing not just to meet but also to host a whole group of new people and (hopefully) treat them to a very cosy and intimate night of good food and wine. A step up from that was starting a series of masterclasses and lunches, both private and ticketed, where you spend about 5 hours in a very small group of complete strangers, in some cases; together you learn how to curate a dinner party, designing a menu in coherence with the season, the tablescape, the type of the occasion etc. Luckily, one of my closest friends happens to be the founder of the most beautiful studio in London, Green Lens Studios, and it is his space that proved such an organic and ideal a setting for these types of gatherings. In addition to that, I have found a kindred spirit in the event and floral stylist, Hannah Bullivant, whose instagram feed quickened my heart. Her approach to table arrangements and a very effortless seasonal touch ticked all the boxes in my check list for an ideal dinner party. Again, luckily for me Hannah was very keen to collaborate, and without really planning things to the minute details, she brought all the right things – the most beautiful lines, vintage candle holders and seasonal rustic flowers; the exact kind of things which even before being arranged into a table setting already promised a truly elevated dining experience. Always looking to create a dialogue between the style of the food and the table on which it will be presented and consumed, we opted for a Spanish/Moroccan theme, with rough linen table cloth and napkins, clay trays and pots for flowers, and dishes like borani, whole roasted cauliflower with cumin, coriander roasted carrots and harissa lebneh. The floral arrangements featured not only the most delicate seasonal flowers but also some herbs that were used in the cooking of the meal itself. 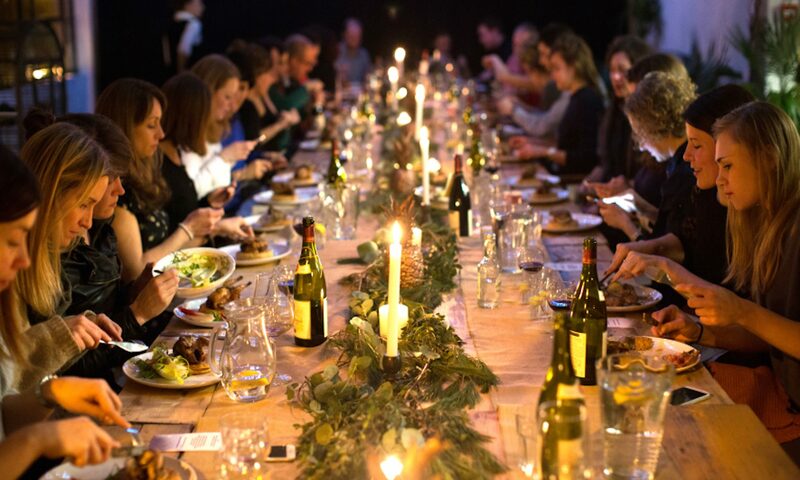 What can create a better coherence between all the senses during a dinner party, when the site, smell and the taste buds are all heading in the same direction!